This is what our boat looked like at first. We took this picture on the morning that we arrived in Richmond to pick it up. 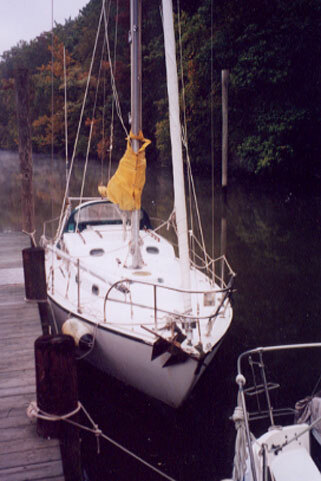 Our first adventure was to bring the boat up the James River and into the Chesapeake Bay. So much was new to us, as we were being passed by huge ships, sailing at night, learning about the navigation beacons, charting our course using GPS, compass, and charts, and most importantly, weathering our first gale. One rough day was when our inboard engine broke. We had just entered the Chesapeake Bay from the James River, when the wind died and we both became seasick (Todd was a little worse off than I was I think.) It was hot and our spirits were low, with no engine power, no wind, feeling horrible, and not making any progress. 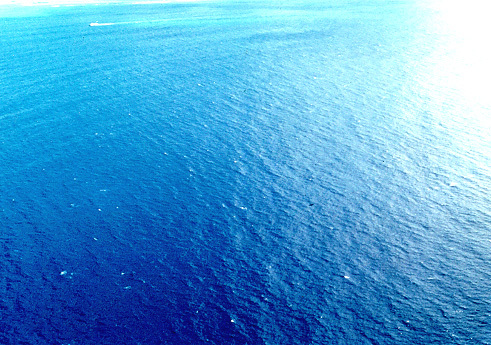 This started when we were near a beacon called Thimble Shoal, and after hours of hoping for any sign of movement, we looked around and realized with grief that we hadn't moved from Thimble Shoal at all. Eventually, Todd was able to fix the engine, and we were on our way again! Another day, we were pretty shaken as we hit some bad weather and the boat tossed and turned that night in the Chesapeake Bay. We struggled to stay far enough away from the shore so as not to run aground or hit anything, while fighting to keep the boat aimed in the right direction, sailing only under storm jib, then later under power alone. Although we thought this was a really bad storm at the time, it wasn't actually that bad, but it was just our first gale. Getting through it was great, and the next time we hit rough weather on our next journey, we were (relatively) unphased. We were so tired and so happy to arrive at the new marina late at night after our first experience of sailing nonstop, day in, and day out. 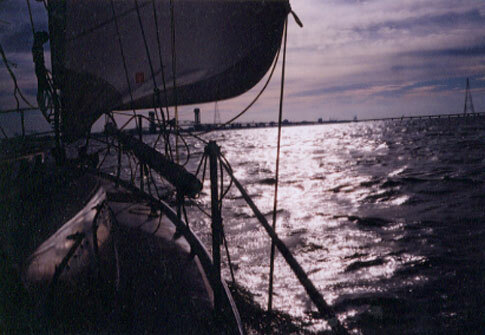 We learned that when sailing, we WILL encounter problems, and we have to be ready to deal with whatever comes. It's a certain sense of accomplishment, though, and there are times of peacefulness being out on the open water that we haven't ever felt before. 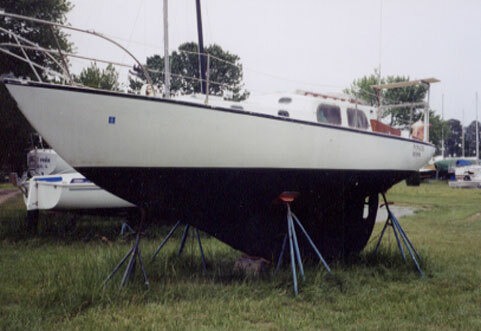 A few months later, we were getting ready for our next trip - the "shakedown cruise" around the Delmarva Peninsula. We arrived in a few days in Pasadena, MD. Our marina, White Rocks Marina, is just south of Baltimore. The boat's previous owner gave us this picture. We decided it needed some work, but it was the right one for us!